If you’re in any way familiar with our family, then you know that we’re just a little obsessed with Colonial Williamsburg here in Virginia. My sister actually works as a writer in the development department for the foundation now, but even before that, we had visited the historic grounds almost every single season. There’s just something magical about wandering the streets of the completely restored historic area, passing horse-drawn carriages, men and women in colonial garb and having the chance to learn about the trades from authentic artists and artisans. Although I’m a sucker for this type of tradition, I’m not so eager to invite traditional design into our home, what with our ultra-modern tendencies. 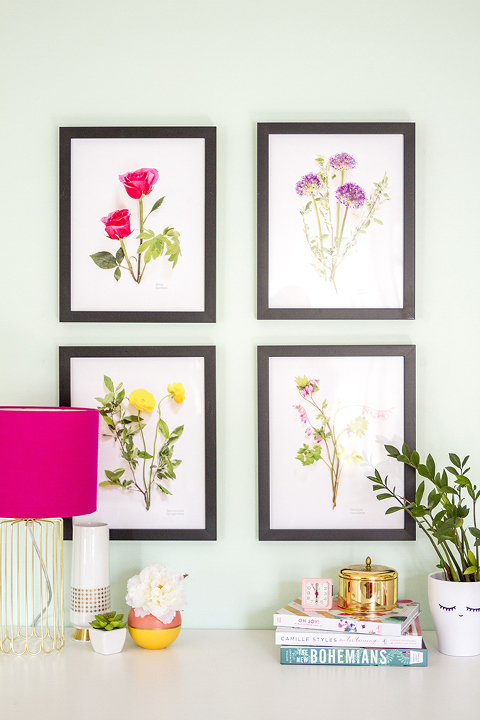 So, to honor some of my favorite Colonial Williamsburg botanical artwork, I armed myself with some live blooms, my camera and then turned to Snapfish Home Décor to bring my vision to life. If you’re unfamiliar with traditional botanical prints, you can see an example here in the Williamsburg Marketplace, but essentially these pieces of art feature hand-colored engravings of illustrated floral portraits. 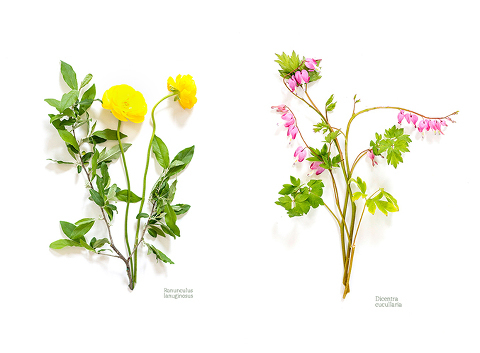 Each flower is represented, typically on its own, against a neutral background and finished with a hand-written or typed Latin label denoting the bloom species. So I took inspiration directly from the source, laying my cut flowers on a white background with their stems meeting at the bottom. After styling and taking the photos (I made five), I uploaded them to Photoshop, increased the saturation and brightness and finished with a bit of Latin text on top. Please don’t look too closely at my Latin, by the way! I tried my best to be accurate, but I may have missed the mark. Happily, only my pro florists and gardeners should be able to notice. Time to print them out. The totally redesigned Snapfish website made it a cinch to upload and order my final botanical photos. The easy-to-use tools allowed me to upload and order in, oh…five minutes flat. And that was mighty appreciated since I did so poolside while on vacation a couple of weeks back. I was free to be as creative as I wanted to be, and after adding and saving my photos to my Snapfish account and choosing frames, my totally custom floral artwork arrived ready to be unwrapped and hung. In case you’re as into the idea of modern live botanical prints as I am, you can download the artwork free of charge! 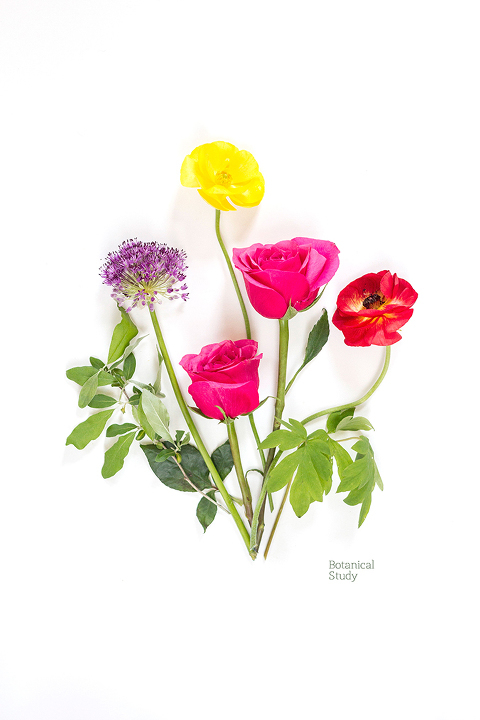 Just click these links to download the printable PDFs: multi-flower arrangement (Botanical Study), yellow flowers (Ranunculus Lanuginosus), purple flowers (Allium Sativum), pink flowers (Dicentra Cucullaria), and red flowers (Rosa Kordesii). To make it even easier for you to recreate the look of my finished and printed live botanical artwork (or favorite photos of your own! ), Snapfish is giving one DGD reader a $100 gift card to shop their collections! In order to be eligible, please comment with what you would do with your Snapfish shopping spree. And don’t forget to also join Snapfish Superfans so that you can share your projects and enter to win even more prizes. Today’s contest is restricted to the U.S. and ends next Wednesday at midnight. Good luck!